One of the landmark indie pureplays, SomaFM (www.somafm.com) has grown into a streaming empire over 14 years. Founded and operated by Rusty Hodge, the Internet outlet is located in a San Francisco warehouse. The current programming lineup includes 28 hand-curated, electronica and alt-genre stations. 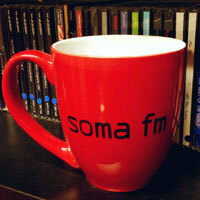 SomaFM is perhaps best associated with Groove Salad, a stream of downtempo ambient tracks, and the second station launched in Soma’s early days. Groove Salad is personally tracked by Hodge, who maintains a programming staff of about a dozen people. Other stations include Lush (vocals), Deep Space One (self-descriptive), Mission Control (more space), and Doomed (“for tortured souls”). Hosted on Shoutcast servers, SomaFM produces a darkly attractive website and streams in several formats and bitrates. There is no built-in player, so desktop listening is best accomplished via a stand-alone mp3 player like Winamp or Windows Media Player. [UPDATE: there is a pop-up player in the browser interface; thanks to @Louth for the correction.] We keep Winamp stocked with SomaFM bookmarks. Groove Salad, the tastiest downtempo mix we’ve ever known, is our go-to station, but we have lately been diving into Sonic Universe, featuring avant-jazz explorations. SomaFM is an entirely ad-free, listener supported production, soliciting one-time and recurring monthly donations, and selling merchandise (branded coffee mugs, hoodies, etc.). Mobile listening is provided through a four-dollar Android or iOS app.